Everyone in metal detecting focuses on their oldest, strangest or richest finds. I wanted to focus on how much the normal modern change I find amounts to. I’ve been metal detecting since I retired, 5 years ago, first with a Garrett ACE 250 and lately with a Garrett AT-Pro and a Garrett carrot pinpointer, all from KellyCo. There aren’t a whole lot of historic sites around Houston, Texas that allow access to metal detectors so much of my time is spent at sport fields, parks, playgrounds and, on the weekends, school yards. An important note is that I stay off the sport fields themselves and concentrate on the sidelines where spectators sit. I’ve found my share of silver and gold but much of what I find is modern change. On January 1, 2017 I started putting all of the modern coins I found into a large jar. The object was to keep doing this throughout the year and then turn them in to the bank in the new year. I averaged about 2 hunts a week of 3 to 4 hours each with shorter hunts in the summer due to the heat. 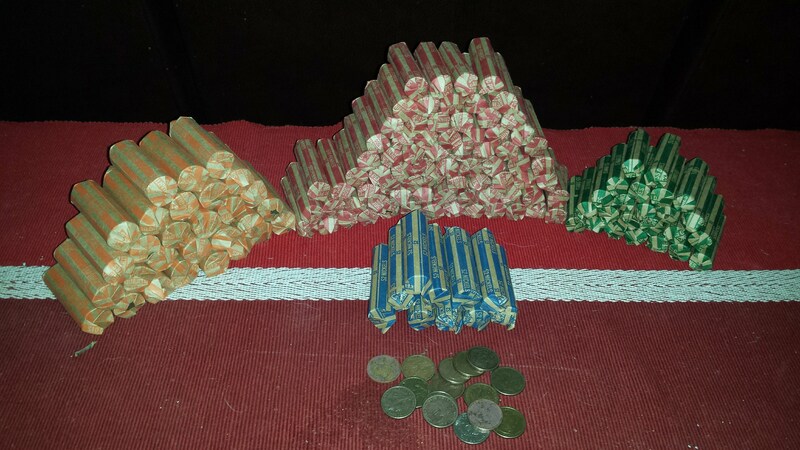 Today I finished a marathon coin rolling session for one calendar year’s worth of modern coins and here are the results: Pennies – 3,794 Nickels – 404 Dimes – 1,206 Quarters – 1,167 Dollars – 15 My total take for the year, not including silver coins, old (pre-1962) cents and all the rings, bling, and tons of junk is $485.49. BTW, that’s almost 45 pounds of coins. 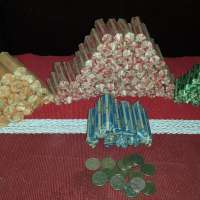 The photo shows the coins that got rolled plus the Presidential dollar coins. They will pay for a lot of gas and batteries to keep me hunting for another year.